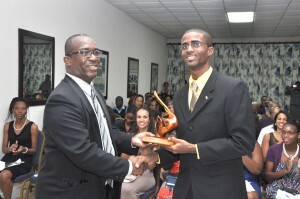 Rico Boyce collects the Michael Clarke award from the Barbados Association of Medical Practitioners head, Dr. Carlos Chase. Improving the reputation of the University of the West Indies and the medical degree were among several challenges issued to the island’s newest doctors last evening by renowned local medical trainer, Professor Emeritus Henry Fraser. The stalwart of the Faculty of Medical Sciences made these remarks at the ceremony of the very first graduating medical class of the Cave Hill Campus as he admonished them to think first of the patients they would treat. “Five years ago you would have been asking yourself if medicine was really the right vocation for you; and I say vocation and not career, because if you see it as a vocation – a calling by God to his service – you will be richly rewarded in all the ways that really matter, not just a comfortable living. If you see it just as a career, to earn a fat salary and a BMW, you will never know the joys that true medical service brings,” he said in his address. He told them as well to never cover up their mistakes because such a practice would come back to “haunt and destroy” them, even as he told them their mission was to empower the university that had directed them these past years. “But our mission is in the wisdom of the ages – to empower UWI medical alumni to think for life and learn for life. Your medical school has tried to be there for you, and everyone in this UWI family hopes that the brotherhood of UWI will continue in your life, through your active membership of the medical alumni. “There has been good and bad in your course, and that pattern too will continue throughout your life, because that is the nature of life. But make no mistake, your success in life will depend not on what happens to you, but on how you react when it happens,” he advised. Tiffany Shakiera Jordan collects her award. At a time when the world was gripped by terrorism and war, when millions were millionaire while others starved, Professor Fraser told the graduates to remember they were professionals who must be “all things to all people”. “Doctor means you are both a teacher and a leader. You have a moral obligation, to care and to counsel, to cure when you can, and to help find solutions, by constantly updating your knowledge. “But you have an equal obligation to teach and to lead…, to lead as the most privileged members of your community, to lead as members of the UWI Medical Alumni … to improve the reputation of your university and your degree,” he stated. Fraser added: “This society has nurtured you, and UWI has provided your free education. The country is your godfather and the university your guardian angel, these past five years. Be loyal to them, like family, and not to the mighty dollar. The solutions, the answers you will seek, will not all be found on the web, in the gods called ‘technology’ and ‘materialism’. “The real solution lies in your heart, your hand and your soul. Together they are a powerful combination, but at the core must be one love – love and its classmate forgiveness – love for God and love for your neighbour, regardless of colour or creed.